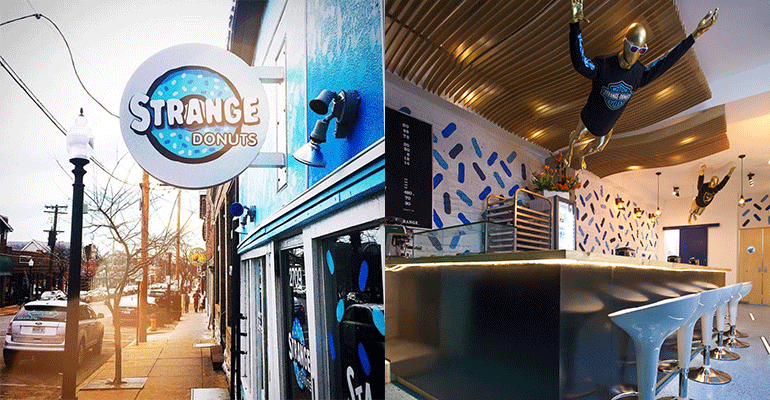 It’s one thing to open a slightly off-kilter doughnut shop with a cult following. It’s another to multiply it across the country and stay strange. That’s the challenge for Strange Donuts, founded in 2013, in St. Louis. The concept has launched a franchising program to take its particular brand of strange across the country. Jason Bockman, Strange Donuts’ CEO, said the chain has two units in St. Louis and two more set to open there within the next few months. The first franchised location is in Mexico City, and is operated by an employee. Now Bockman hopes to grow the concept across the Midwest, and eventually to other regions around the country. All doughnuts are made from scratch in house, with a selection of $1 Classics — Glazed, the sprinkles-covered Rainbow Pony and Jelly Filled — and $2 Creations, like Red Velvet, Blueberry Cheesecake and the St. Louis favorite Gooey Butter, which is a spin on a local coffee cake style. But what attracts the most attention is the $5 “Strangers” line of doughnuts, which are original and sometimes include collaborations with chefs and friends. The Stranger “dones,” as the brand calls them, change weekly and are available on Thursday, Friday and Saturday evenings until they sell out. A recent example was Bart’s Ultimate Revenge, with two Butterfinger fudge cake “dones” sandwiched with Butterfinger buttercream and a dollop of ice cream. Others include chicken and waffles doughnuts, and one that attempted to be a doughnut variation on bagels and lox. They don’t always work, despite the word of mouth marketing generated, Bockman said. A long john topped with black pyramid sea salt, for example, was admittedly a flop. “It was really good, but nobody ate it,” he said. The shops also offer cinnamon rolls for $3 “that are the size of your face,” Bockman said, with flavors changing each month. Lemon-sage cinnamon rolls were featured in April. From Thursdays through Sundays, Strange offers vegan and “gluten-less” doughnuts, which they do not call gluten-free because cross-contamination with regular flour is possible in a shop where the doughnuts are made from scratch. Strange Donuts’ single-origin coffee is also a key feature, Bockman said. The company is growing its retail distribution and ships the coffee around the world. Units average about $400,000 to $450,000 in annual sales, Bockman said, and store models include units just over 1,000 feet, to one as small as 300 square feet. The latter includes a full made-from-scratch menu, but limited beverage offerings. Catering also helps to boost revenue, Bockman said. “It’s not out of the ordinary to do three weddings per weekend, per store, in the summer,” he said. Strange Donuts also delivers in partnership with third-party delivery providers. “We make a couple of thousand dollars a month using them, but I really like people to experience the brand in stores, instead of just the product,” Bockman said. Strange Donuts is not only up against well-established national chains like Krispy Kreme and Dunkin’ Donuts. 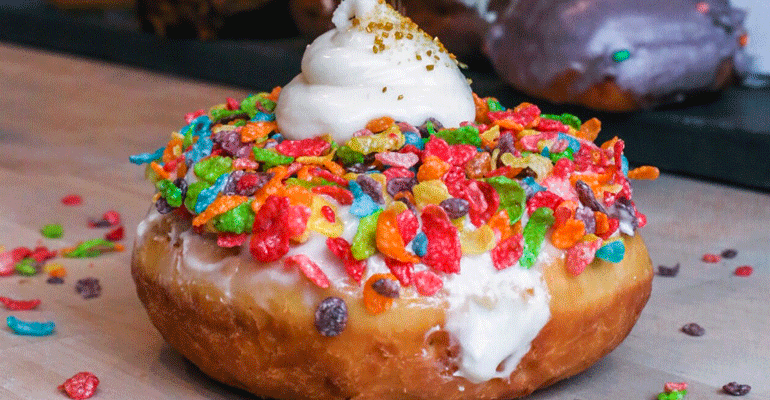 There is a growing crop of concepts with a cult following, like six-unit Voodoo Doughnuts, based in Portland, Ore.; 23-unit Top Pot Hand-Forged Doughnuts & Coffee chain from Seattle; and two-unit Trejo’s Coffee & Donuts in Los Angeles. Any town already has good doughnuts, Bockman said, but Strange Donuts tries to set itself apart with an emphasis on branding.